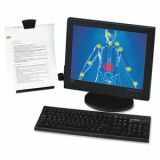 Mounts on left or right side with Command™ Adhesive Strips (included). Swings out of way when not in use. 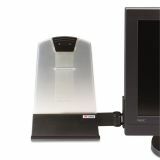 3M Clip Copyholder, Flat Panel Monitor Mount, Plastic, Holds 35 Sheets, Black/Clear - Document holder is designed specifically for use with flat panel/LCD monitors but also works with CRT monitors. Mount to left or right side. Clip accommodates up to 35 letter-size and legal-size sheets in portrait/landscape orientation. 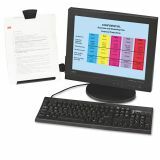 Document holder includes Command Adhesive to mount to monitor, allowing clean, easy removal with no residue. Angle and height position can affect sheet capacity. Test before using.